and which for longer haul. The world of whiskies can seem truly daunting to the beginning whisker* but fear not for here is a guide to types of whiskies! I suppose the most famous region for producing whisky is Scotland. In Scotland the Scotch Whisky Association makes rules for what can be called whisky in Scotland. Scottish whiskies must be aged for at least 3 years in oak casks and the only ingredients allowed are water, grain, and yeast. Even though it is well recognized that a great deal of the flavour of whisky comes from the oak casks, it is not termed in ingredient (which I find strange). The most commonly sold and consumed Scotch whisky is the blend. A blended whisky is made up of malt whisky and grain whisky. Malt whisky is made from malted barley and grain whisky can be made from any type of grain. Single malt whiskies are malt whiskies that come from a single distillery. There is some controversy over who produced whisk(e)y first, the Scots or the Irish. Either way, Irish whiskey has just as long a history as Scotch whisky. Notice that I am spelling whisky for Scotch and whiskey for Ireland. That’s the convention which has something to do with Irish distillers trying to differentiate their product from what they believed was inferior Scotch whisky. Instead of malt whisky, a lot of Irish distilleries produce partially malt whisky. 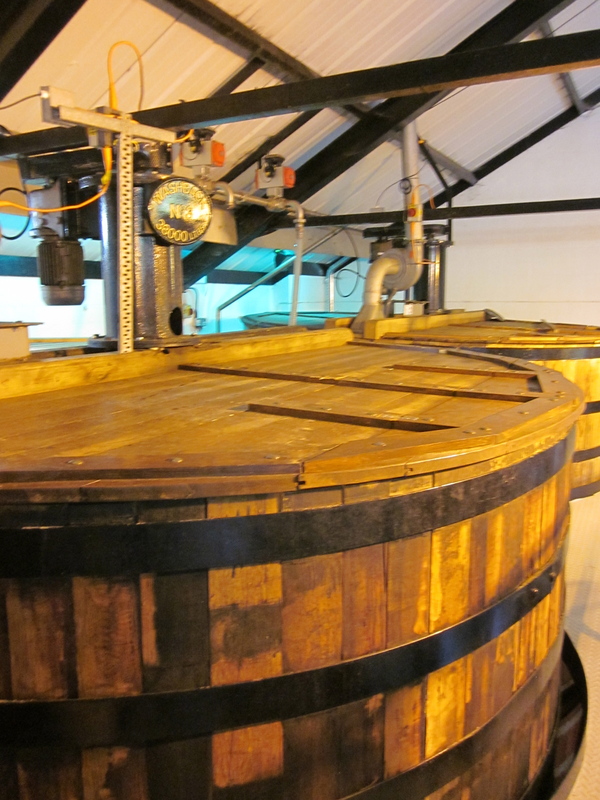 Basically, they mix malted barley with unmalted barley to make the beer that is then distilled into spirit. This has something to do with a tax that was put on malted barley back in the old times and the traditon lives on. Some Irish distilleries do produce malt whisky but a majority of them focus on making whisky for blends. I am going to try and make this as unoffensive as possible. It sounds really pretentious to explain to people how they should enjoy something. I am just going to go over what is typically practiced among whisky drinkers. Please enjoy whisky however you like. The more you enjoy it and the more you buy it the better for all of us! 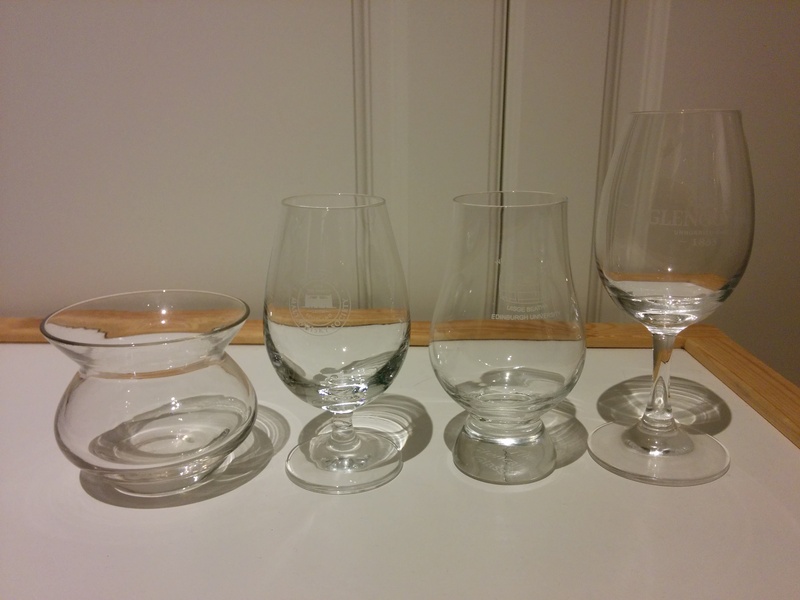 The most common one is probably the Glencairn glass which is second from the right. You might notice that all of the glasses are curved inward at the upper half. Like a wine glass, this allows you to swirl the liquid around to release aromas. It also helps concentrate the aromas. So you will typically fill these vessels with somewhere between 25-35 ml of whisky. That’s called a dram. If you fill them too high the whole swirling thing doesn’t work out too well. Unlike the movies, people don’t really swig their whisky or take shots here. Whisky is meant to be savoured. I mean it’s expensive. Bypassing your tongue with a shot like movement kind of defeats the whole point. If you really like the stuff, you’ll want to enjoy it as much as possible. So you’ll start by swirling the whisky around in the glass so it coats the sides of the glass. This will concentrate the whisky aromas in the glass. Shortly after swirling, you bring the glass up to your nose and start inhaling through your nose when you are about a nose length away from the rim of the glass. This will help your nose get accustomed to the alcohol vapors so that you don’t get that burny feeling. Now with your nose as close to the opening of the glass as you like, inhale deeply. What you are trying to do is take in all those lovely smells. The impression you get from this is called the “nose”. No wonder. People usually repeat this a few times before actually drinking the whisky. Ok your nose knows and your mouth wants a piece of the action. Time to drink! Instead of flinging the glass into your face to achieve the high alcohol velocity, try gently sipping the whisky. Hold it in your mouth and let it rest on the tongue. This is called “tasting” the whisky. It’s pretty good. After you swallow, you will probably notice an aftertaste. That lingering ghost of the whisky. The spirit of a spirit. This is called the “finish”. The nose, taste, and finish are the three things that people usually pay attention to with Scotch whisky and it’s what you usually see in tasting notes. Feel free to repeat steps one to three as much as you like. Within reason.